It's getting out of control. I just wish I were a lot older or a lot younger. Author Pat Kirkham discusses the opening titles for Bonjour Tristesse, from her authoritative book Saul Bass: A Life in Film and Design. The symbol is a haunting face created from a few brushstrokes. Here the poignant sadness embodied in the title of the ﬁlm is expressed as a haiku-like eye and tear. 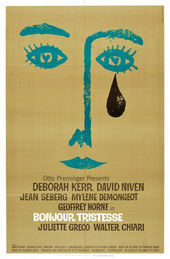 The Madonna-like symbol represents both women in general and a speciﬁc young woman, Cecile (played by Jean Seberg). The lyrical title sequence exquisitely captures the elusive delicacy as well was the sadness that lies at the heart of the ﬁlm. It previews the ﬁlm's narrative, from the lost innocence of adolescence to the sadness that knowledge and adulthood bring to the young woman.